Dream Cruises is extending its Ageless Dreamers Program to Genting Dream, currently homeported in Singapore. 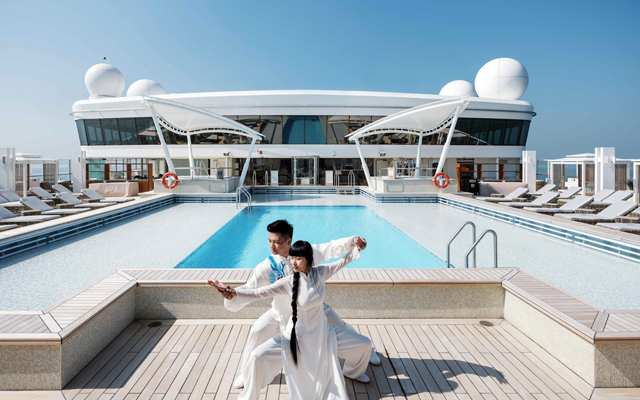 An enrichment series for mature cruisers first launched on World Dream in May 2018, the Ageless Dreamer programme will be rolled out with new elements ranging from Cantonese opera to Chinese embroidery and tai chi. On designated sailings from Sept 23 to November 11, cruisers will be able to enjoy Cantonese Opera classics such as Di Nü Hua (帝女花), Swallows Fly Apart (分飛燕) and Love and Passion (萬水千山總是情) by Cantonese Opera artists from Guangdong province. The artists will also share stories about their professional careers and personal hobbies. In addition, fans will have the chance to don traditional costumes and belt a tune or two under the guidance of professionals, as well as participate in interactive activities such as mask decoration workshops and photo sessions with traditional headgear, makeup and costumes. Teochew embroidery (chao xiu) master Chuk Shu-Qin will bring her expertise and over 40 years of professional experience to World Dream, where she will teach guests the basics of this ancient craft. The Tai Chi and Shaolin Wushu Academies at Sea will be back from September onwards. Founded by grandmaster Wang, who also coached e-commerce tycoon Jack Ma, Wang Xian Institute of Researching The Arts of Tai Chi will continue their partnership with Dream Cruises to host the Tai Chi Academy at Sea on every five-night cruise of World Dream, while professional instructors from Hong Kong tai chi Master will conduct a series of tai-chi classes for all two-night cruises. Ageless Dreamers on Genting Dream may attend complimentary tai chi lessons from three masters in every cruise from October 1 to November 16. Led by Yang Xiaolin from China, who is a tai chi coach certified by the Singapore Wushu Dragon and Lion Dance Federation, as well as a member of National Registry of Coaches. Yang will be joined by Wendy Yum, who has been teaching in Singapore SoKa Association since 2001, and Teck Ghee C.S.C since 2005. Shaolin master Zou, who hails from the Shaolin Culture Professional School in Zhengzhou, will host the Shaolin Wushu Academy at Sea on select sailings of World Dream in September and October, where guests will learn shaolin wushu basics such as Shaolin Baduanjin, Five Steps Boxing and Shaolin Yi Jin Jing. “ageless happiness” through sounds and breathing, among other methods said to enrich mind and body. Nadine Tengco, who co-authored the Century Superbod Abs Plan and the Superbod Abs Diet, will offer weight-loss hacks. Throughout the promotion period, Ageless Dreamers will enjoy on-board privileges, ranging from retail discounts to complimentary souvenirs. Early-risers may also participate in Walkathon Wonder, where they will start the day with a refreshing walk on the open deck, followed by cool-down at Crystal Life Spa, with complimentary refreshments and a health talk. All walkathon participants will receive a complimentary pedometer to keep track of their progress.